Well over thirty years ago, during a Tent Mission on Wanstead Flats, East London we met Sister Lara Adeymo. I well remember a journalist reporting on that Crusade and describing our wonderful tent site as “a God forsaken piece of land”. How blind! The Lord was there and doing great things night by night. The preaching of the Word by Evangelist Albert Chambers at that time, made great impact on the life of this young Nigerian woman, and in fact it changed the whole course of her life. Sister Lara had a good job in a main Post Office on Mile End Road, near The London Hospital and was set to continue that career. However she came under the wing of this Ministry and entered wholeheartedly into our Children’s Gospel Outreaches. Having a very teachable spirit, she learned quickly and gathered a tremendous store of teaching methods and materials during her time with us. It was clear the Lord was training her for her life’s work back home in Nigeria and the day came when we wished her God speed as she flew back home, with a burning vision to bring a multitude of Nigerian children to Christ. She recently celebrated twenty five years of her Ministry, Child Gospel Mission. 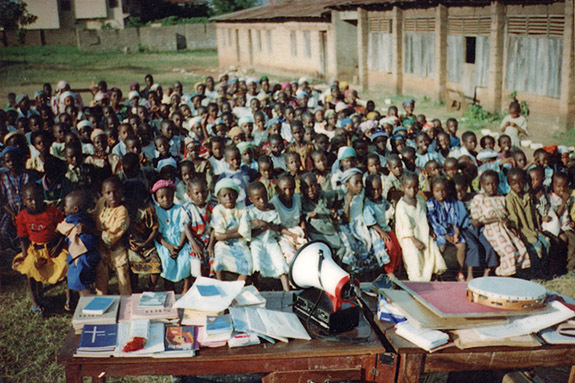 in which time she has reached thousands of children in state schools in Nigeria, but has also established a State- recognized Orphanage and Mission Station in Ogbomoso. Watch this space for further news of Lara and World Vision for Christ’s involvement in her work out there!.